Home Fuel Pump prices at record highs – Hold onto to your number plates! 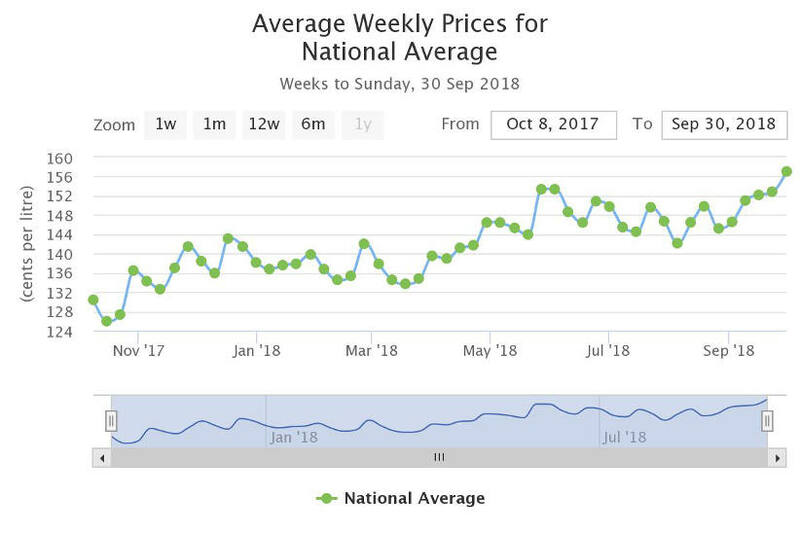 According to the Australian Institute of Petroleum website, in the week ending 30th September the national average price for ULP peaked at 157 cents per litre. This is the highest national average pump price for ULP ever! So don’t be surprised if your number plates go missing. In May this year FAN reported that pump prices had reached a new three year high and advised Fleet Managers to look at their budgets for 2018/19 financial year so they are prepared for the increase in fuel expenditure. After this warning the pump prices stabilised for a few months until reaching new highs in September. The reason your number plates might go missing is the correlation between high fuel prices and number plate theft (mine were stolen last week). So if the general public are changing their behaviour in a negative way as a response to the increased cost of fuel, what are fleet drivers doing? Back in 2006 the NSW Bureau of Crime Statistics and Research looked at this issue in their September Bulletin discussing the relationship between petrol theft and petrol prices. They made some observations which are a warning for Fleet Managers and small business providing employees with access to fuel cards and other purchasing methods. ‘The connection between petrol theft and the theft of number plates is another noteworthy issue. It is easy to understand why acquiring stolen number plates would facilitate the untraceable theft of petrol. It is interesting, therefore, to see that that connection is well supported in statistics recorded by NSW Police. While number plates can be stolen for various reasons, the high correlation between the two crimes suggests that a component is directly related to petrol theft. For most people petrol is a necessary commodity for daily life. While a portion of petrol theft may be perpetrated by individuals who always steal their petrol, our analysis suggests that there is component of petrol theft that is discretionary and is committed in response to external factors such as cost. The study suggests that high petrol prices present an increased incentive to steal which some members of the community succumb to rather than absorbing the extra expense. Similarly, it appears that these individuals are prepared to purchase petrol legitimately when prices fall. It seems, therefore, that at least a proportion of the people who perpetrate petrol theft variously buy and steal petrol at different times’. ‘For every extra 10 cents per litre added to the average monthly petrol price, we can expect up to 120 extra reported incidents of service station fraud for that month in NSW. The model predicts that if average monthly petrol prices reach $1.70 per litre we can expect reported incidents of service station fraud to move close to 1,600 incidents per month for NSW’. ‘The value of petrol theft incidents is well recorded and our review contained only one event for which a value could not be established. The average cost of petrol theft was $62.10 (including thefts ranging from $5 to $447). When scaled up, the estimated cost of petrol theft in NSW in the 12 months to September 2013 was nearly a million dollars ($928,340)’. Looking at the fuel usage reports from your fuel card provider are one way to catch a thief. Another way is telematics which highlight exceptions by comparing the location of the vehicle to the location of the fuel purchase. With an average fuel theft of $62 there’s a financial reason to invest in a telematics solution. While pump prices remain high households will be experiencing financial pressure and fleet drivers may feel ‘increased incentive to steal which some members of the community succumb to rather than absorbing the extra expense’.